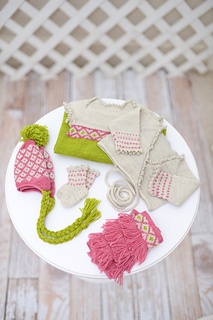 This design is part of the New Girl layette collection from Tot Toppers and is shown with a coordinating piece from the set. New Girl is available as a booklet or an e-book and the patterns are now available individually as well. 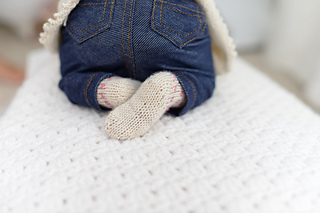 Baby booties are as classic as it gets and this pair of tiny socks is the perfect accent to any of the other pieces in this collection. • They are worked from the toe up with short row shaping at the toe and heel. Legs are accented with wee pindots and a picot bind-off for her delicate sensibilities. The Fair Isle works double duty by adding to the cute factor while also helping to keep the socks on her feet. • This is a perfect first-colorwork project, as the floats are teensy and the stranding only happens on a few rounds. • Shown in Preemie.